Cappuccino is a coffee drink which is traditionally composed of espresso and hot milk and topped with steamed-milk foam. Its name comes from the Capuchin friars referring to the distinctive red-brown color of their hooded robes. 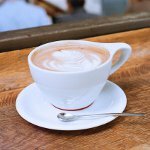 Coffee drinks with milk similar to cappuccino have been known for a long time, but cappuccino in its modern form started to gain popularity in the 1950s due to the emergence of coffee machines that could make espresso and also heat milk. Its popularity in the United States boosted in the mid-1990s. A traditional cappuccino is served as a 150—180 ml drink, but commercial coffeehouse chains often serve the cappuccino as a 360 ml drink or even larger. Milk foam on the top of a drink can be decorated with artistic drawings called latte art. Cappuccino differs from caffè latte in size. It is also a bit stronger as it usually contains more espresso than caffè latte. To celebrate the National Cappuccino Day, go out to your favorite coffeehouse and indulge yourself with a cup of hot cappuccino. If you have a home espresso machine with a steam wand, you can try your hand at making cappuccino yourself.